Valentin Zykov: Carolina Hurricanes Last Grasp for Playoffs Ladder? 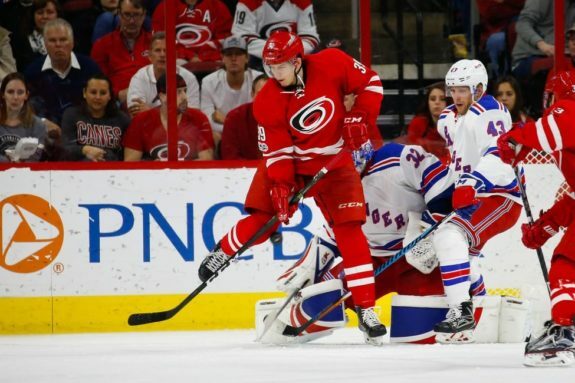 Valentin Zykov – Hurricanes Last Grasp for Playoffs Ladder? The Carolina Hurricanes announced Sunday night that they have called up Valentin Zykov from the Charlotte Checkers. Does the call-up represent a last grasp at the playoffs or is it simply that they’ve acknowledged that they’re out of the playoffs so, ‘let’s call some guys up and give them a look’? The answer likely lies somewhere in the middle. Zykov is a goal scorer and could be the boost that the Hurricanes need to continue to have a shot at the playoffs and if it doesn’t work out, at least he’ll have had some ice time during a pressure-packed time of the season. At the very least, this will help the coaching staff in preparing for next season. Zykov, 22, has scored one goal in two career NHL games with the Hurricanes. The 6’1”, 224-pound forward scored his first NHL goal in his NHL debut on March 9, 2017 against the Rangers. Zykov has recorded 48 points (30g, 18a) in 57 games with the Checkers this season and leads the AHL in goals and power-play goals (16). Zykov’s 48 points, even though they are at the AHL level, are scintillating considering the Hurricane’s need for an offensive boost. The release also notes that the native of St. Petersburg, Russia was drafted by the Los Angeles Kings in the second round, 37th overall, in the 2013 NHL Draft. He was acquired by the Hurricanes in exchange for Kris Versteeg in February 2016. He has been a player that many fans have wanted to see playing with the ‘Canes since head coach Bill Peters took the team to the woodshed a few weeks ago. There’s three healthy bodies, there’s at least three that can go in. If not those three, there’s a group down in Charlotte, too, right? We can’t put that group out again after that. It’s not acceptable. The three “healthy bodies” Peters was referring to were Phil Di Giuseppe, Marcus Krüger and Josh Jooris. Kruger and Jooris were put on waivers and sent to Charlotte, with Jooris later being picked up by the Pittsburgh Penguins. Di Giuseppe has continued to play with the Hurricanes while the “group down in Charlotte” were never brought up as many had hoped they would be. A little over a month later, Zykov is finally here. Here to do what and for how long is anybody’s guess. Maybe he will be a healthy scratch Monday night against the New York Rangers or maybe he will play and score two goals. It’s unsure what his impact will be if any but it’s without question that he has had an enormous impact on the Checkers. It would be fabulous if Zykov could provide the spark the Hurricanes need to start a winning streak. The fans would love it and would feel a sense of vindication – especially for those who have wanted him to be brought up for some time. The ‘Canes are six points out of the second wild-card position, currently held by the Columbus Blue Jackets, and four behind the Florida Panthers who are ahead of them in the chase. It would be miraculous for the Hurricanes to make the playoffs with only 14 games left, but a winning streak like the Panthers have had could go a long way to making the chase interesting. Zykov could be the Hurricanes’ last grasp at the playoffs or give the coaches and management a look at next year’s possibilities. Either way, it will be fun to watch.